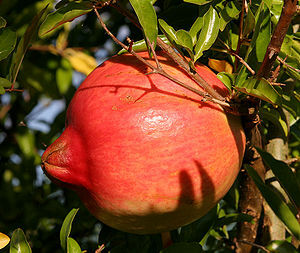 Pomegranates contains polyphenols, tannins and anthocyanins, all of which are beneficial antioxidants. This high antioxidant content rivals that of many other fruits, red wine and green tea. The juice contains fibre, potassium and vitamin C. Research shows that pomegranat juice could possibly decrease prostate cancer. It may also prevent the hardening of the arteries by keeping the arteries clear from fatty deposits and may even slow the progression of heart disease. The antioxidant properties of pomegranate help to guard the body against the substances that can cause premature aging, heart disease, alzheimer’s, cancer and other diseases or conditions. It has been used around the world as a way to clear the skin. In folk medicine it has been used to treat inflammation, sore throats and rheumatism.